Hi Friends, I am sharing some famous and hits dialogues of Sunny Deol Ghayal movie. This movie was released in 1990. 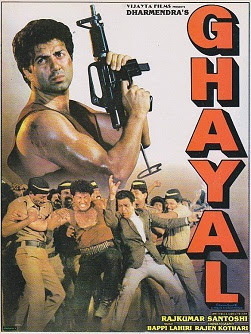 Ghayal is the one of the best movie of Sunny Deol. It was the second biggest hit movie of 1990. The movie had won seven Filmsfare Award. Sunny Deol and Meenakshi Seshadri were in main lead role. This movie was directed by famous Bollywod director Rajkumar Santoshi and produced by Dharmendra. The another sequel Ghayal Once Again also released in Feb 2016. This is also hit movie. In Ghayal movie some hard hitting dialogues were delivered by Sunny Deol. All dialogues of this movie is hit and popular. Here I have collected some best dialogues of Ghayal Movie. I hope, You will like my post.